ESOPs and RSUs have become common in India with start jobs gaining popularity. Several international companies with employees in India also offer ESOPs. Let’s understand how ESOPs are taxed. ESOP – or Employee Stock Option Plan allows an employee to own equity shares of the employer company over a certain period of time. The terms are agreed upon between the employer and employee. Grant Date – The date of agreement between employer and employee to give an option to own shares (at a later date). Vesting Date –The date the employee is entitled to buy shares, after conditions agreed upon earlier are fulfilled. This date is also agreed on grant date. Vesting Period – The time period between the grant date and vesting date. Exercise Period – Once stocks have ‘vested’, the employee now has a right to buy (but not an obligation) the shares over a period of time. This period is called exercise period. Exercise Date – The date on which employee exercises the option. Exercise Price – the price at which employee exercises the option. This price is usually lower than the prevailing FMV (fair market value) of the stock.An employer and employee agree on ESOP terms on the grant date. Once the employee has fulfilled the conditions or the relevant time period has elapsed, these employee stock options are vested. At this time the employee can exercise them or put simply – buy them. The employee is allowed some time period during which this option to buy can be exercised. Once the employee decides to buy, these stock options are allotted to him at an exercise price which is usually lower than the FMV of the stock. Of course the employee can choose not to exercise his option. In that case, no tax is payable. At the time of exercise – as a perquisite. When the employee has exercised the option, basically agreed to buy; the difference between the FMV (on exercise date) and exercise price is taxed as perquisite. The employer deducts TDS on this perquisite. This amount is shown in the employee’s Form 16 and included as part of total income from salary in the tax return. At the time of sale by employee – as a capital gain. The employee may choose to sell the shares once these are bought by him. If the employee sells these shares, another tax event happens. The difference between sale price and FMV on the exercise date is taxed as capital gains. Advance Tax rules require that your tax dues (estimated for the whole year) must be paid in advance. Advance tax is paid in instalments. While the employer deducts TDS when you exercise your options, you may have to deposit advance tax if you have earned capital gains. For financial year 2015-16 for individuals instalments are due on 15th June, 15th September, 15th December and 15th March. By 15th March 100% of your taxes must be paid. See more details about advance tax here. Non payment or delayed payment of advance tax results in penal interest under section 234B and 234C. However, it may be hard to estimate tax on capital gains and deposit advance tax in the first few installments if sale took place later in the year. Therefore when advance tax installments are being paid, no penal interest is charged where installment is short due to capital gains. Remaining instalment (after sale of shares) of advance tax whenever due must include tax on capital gains. To properly calculate tax on sale of ESOPs certain other aspects need to be considered as well. At what rates your capital gains shall be taxes depends upon your period of holding. Period of holding is calculated from exercise date up to the date of sale. Equity shares listed on a recognised stock exchange (where STT is paid on sale) are considered long term when held for more than 1 year. If these are sold within 1 year, these are considered short term. Currently, long term gains on listed equity shares are tax free. And short term gains are taxed at 15%. In case you have incurred a loss you are allowed to carry forward short term capital losses in your tax return and adjust & set them off against gains in future years. Long term loss on equity shares is a dead loss and has no treatment, simply because gains are not taxable as well. The income tax act differentiates between tax treatment of listed and unlisted shares. The tax treatment of shares which are unlisted in India or listed out of India is the same. So if you own shares of an American company and therefore not listed in India, those may be considered unlisted for the purpose of taxes in India. These shares are short term when held for less than 3 years and long term when sold after 3 years. The period of holding begins from the exercise date up to the date of sale. In this case short term gains are taxed at income tax slab rates. And long term gains are taxed at 20% after indexation of cost. 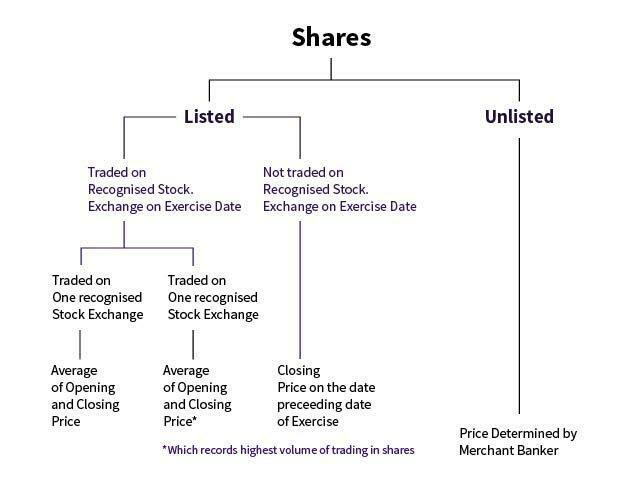 Tax treatment of listed shares is mentioned above. Your income is taxable in India according to your residential status. If you are a resident, all your incomes from anywhere in the world are taxed in India. But if you are a non-resident or resident but not ordinarily resident and have exercised your options or sold your shares, you may have to pay tax outside of India. In such a case, you may be able to take benefit of double tax avoidance treaty or DTAA. Which makes sure your income is not taxed twice. Several disclosures have been added in income tax return forms for foreign assets. If you own ESOPs or RSUs of a foreign company, you may have to disclose your foreign holdings under schedule FA of your income tax return. These disclosure requirements are applicable to a resident taxpayer. On the vesting date the employee gains a right to exercise his option or buy the stocks. But there is no obligation, employee can choose to not exercise his option. In such a case there shall be no tax implication for the employee. If I exercise ESOPs, what do I get, a certificate for shares or something else? What other rights do I get with it? Yes you will get a certificate, usually in paper. ESOPs may or may not come with voting rights. If you are in a very senior position, and these ESOPs are substantial, say more than 5% of total, there are other considerations involved, you may have voting rights. The employer company may have to make relevant disclosures etc. Say I have been allocated 300 ESOPs, can I exercise them in parts? When you are given the option to exercise your ESOPs a time period is given within which you have to exercise them. You can spread them during that period. Does their FMV vary substantially during this period? If yes, and if you feel this would allow you to spread your cost, you can exercise in parts. Usually this strategy is adopted if shares are listed and it helps you spread your cost. Mostly, does not make a big difference in case of unlisted shares. From tax perspective, is exercising in current FY better or next is also fine? There is no change in tax rules for unlisted equity shares between FY 2016-17 & FY 2017-18.